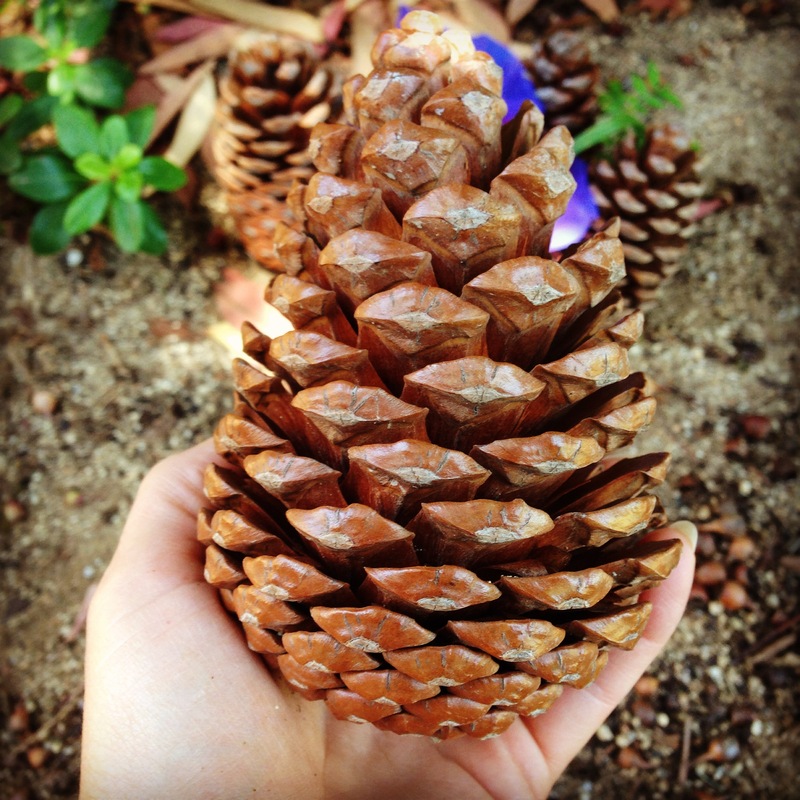 This pinecone is beautiful mathematical order. Fibonacci. Like the human ear. DNA. But our stories as filtered through one perspective, the personal narrative? Are they not creative attempts to martial order where there might otherwise be none? As much as I study, write about, and breathe literary fiction and nonfiction, or perhaps because I study, write about, and breathe them, I offer one caveat and that remains: beware. Have doubts. Technology will give, and already has given, greater access to objective narrative through the ability to capture images constantly, but still we must maintain healthy doubt. Filters color reality and create a mood; a photographer’s perspective is still subjectively oriented; anything that passes through an act of interpretation has been artfully acted upon. Writing and narrative-making are useful analogies, though, when talking about the process of living life. We brainstorm, we have a go, we often find the need to revise ourselves or our actions, we have another go, and if we’re lucky we continue this tweaking process until somewhere around the age of 90 when we slap a hasty conclusion on the thing and dash it all in. When I speak about living life artfully and with joy, I think that includes finding the magic in the chaos and possibly parsing that chaos into some intelligible form to make a coherent life. Possibly the role of artist or creator is really more that of an interpreter, translating chaos and randomness into some form from which we can learn and extract joy. I am not sure, nor have I ever been sure. I celebrate that agnosticism in myself, for the very fact that a love of discovery through curiosity keeps me open to the tweaking process. I am not finished; none of us are. 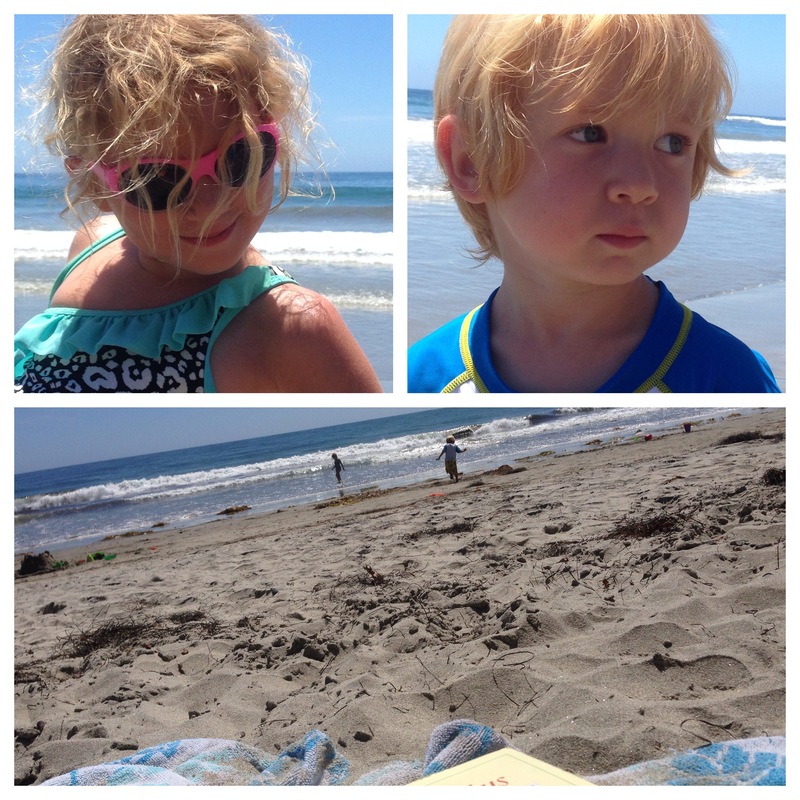 One week ago today I took my children to the beach with a friend of mine from college. It was a lovely afternoon—lunch at Swami’s on the 101, exploration, the gorgeous blue ocean—until it wasn’t…until it was again. Katie hadn’t been to the beach to swim for awhile (strolls along the Oregon coast and Bodega Bay therefore don’t count), and she had forgotten about the sand. I mean, the way sand sticks to you and gets in everything and goes everywhere and you cannot really get it off. I love that about sand, and Katie doesn’t. Especially when she hasn’t been prepped for it. I don’t tell Katie’s story on my blog, because it is hers to tell. I guess I could tell it as her mother and how her story affects mine, but it still isn’t mine to tell, I don’t feel. I know what my priorities are: love on my children, celebrate them, keep a record of the magic we shared, teach them how to focus on what’s good, and give them strategies to find their way through what isn’t so good. I run defense between them and the world even while they learn about it, and I strongly believe in the importance of doing so. Katie likes order, control over variables, and predictability. She also wants to be able to do things perfectly the first time, gets frustrated when there are difficulties, and sometimes fixates on thoughts in her head. She startles easily. She has learned how to tell me when she has “tummy butterflies.” She is a happy child, except moments when everything feels bigger than she is. Ever since she was in the first year of life, she has what I used to call “hot cross buns” and what we now call an “episode.” It is more than a tantrum; I know the difference. We’re watching. We’re tweaking and working on it. We’re giving it time. So, the sand issue. The details of how the issue began are relatively unimportant here. Katie went bonkers. At the beach, in public, full scale for about half an hour to 40 minutes. My friend saw. Everyone saw. It was bananas. More than a tantrum. I would have left with her (a tried and true strategy), but there were many reasons why that wasn’t a viable option at the moment—you’ll just have to trust me on that. In fact, it was so large scale an episode that another mother came over to see if Katie was okay and, making the assumption that it was because I wasn’t playing with her, offered to play with my child. She had not seen anything that lead up to bananas-ville, but she assumed it was for the sole reason that I would not help Katie put water on her sand crab castle (as if!!!). Yes. This happened. Her attention actually caused Katie to go into a bigger panic, as it was the first moment Katie realized people could see her. Shortly after, I was finally able to be successful in coaxing Katie to sit in my lap and just look out at the ocean and breathe. I tried to absorb her anxiety away from her and give her my patience in return. She finally relaxed, and I looked out at the water and cried some silent tears out of worry for her. Then I pulled myself together. What would a writer do? We kept on with the day and carried on, but it was a bum draft on our hands, that’s for sure. No real way to salvage some of those paragraphs except to keep writing. (Interestingly enough, a few moments after she had fully relaxed, Katie wrote a message to me in the sand, “I love you Mommy”—she, too, knows the power of writing). I didn’t publish anything about our beach day that day, because the story was not yet finished. It did get better after the episode, but the memories were not quite yet what they COULD be. I see nothing if not potential, in everyone and everything. I have been given the criticism more than once that I am “too happy.” If that’s true (too? I mean really? is that even possible? ), then it is because I don’t often give up on people and moments, unless there is some very good reason to do so. I will say with authority that happiness does not come from having everything just as we want it to be all the time—happiness derives quite from the opposite, in my experience, and from the effort it takes to find the good—or MAKE the good—in even the most challenging moments. Which brings us to today. Writers know that redemption resides in the power of revision—the redo. Let’s do it again, this time with style. Let’s have a second chance. Let’s rewrite the story the way we wish it to be—it is our one promised freedom, the potential of life to better itself. I asked Katie a couple of days ago if we should return to the same beach today and make a new set of memories for ourselves, if she would like a chance to revise and rewrite by returning. She did, and we did. We called for the major redo. Hey life, please know we’re doing this over. We don’t have to settle for one bad episode on the beach and then call it quits. Oh no. Let’s make it what we want this time, let’s have the BEST day, Katie. Hold your head up—we can revise this. Of course this time, we brainstormed in advance. What are our steps for dealing with sand? Which suit do you want on? When should we put it on? Etc. etc. And it could not have been better. 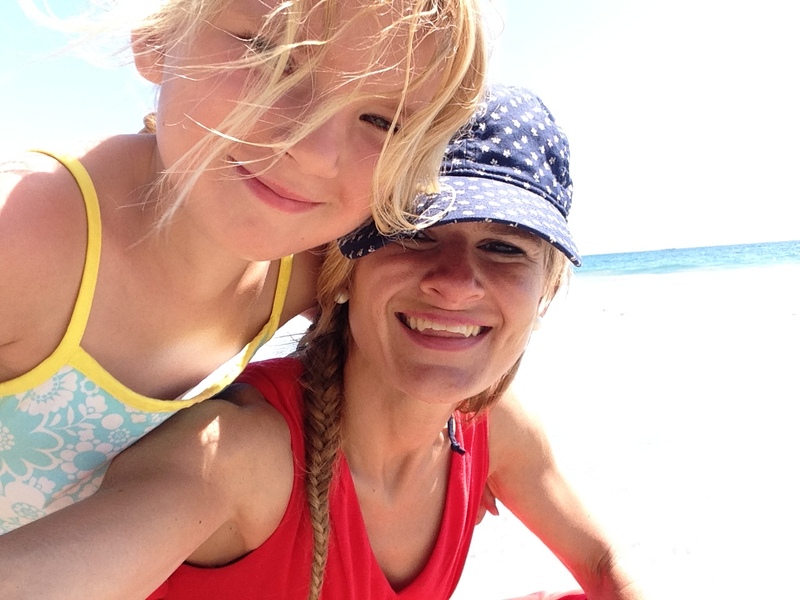 Katie cavorted around with joy, saying, “I don’t know why I didn’t like the sand! I don’t know why I didn’t like the sand!” We built a castle, played in the waves, looked at anemones, walked around, just enjoyed each other for more than five hours. Nary a squabble or quibble. I felt thankful the entire time for this excellent day. I guess that makes up for the other lady, right? Foil characters? I kind of had to smirk at the weird coincidence, there. Bah-da-bing. Lunch at Swami’s! 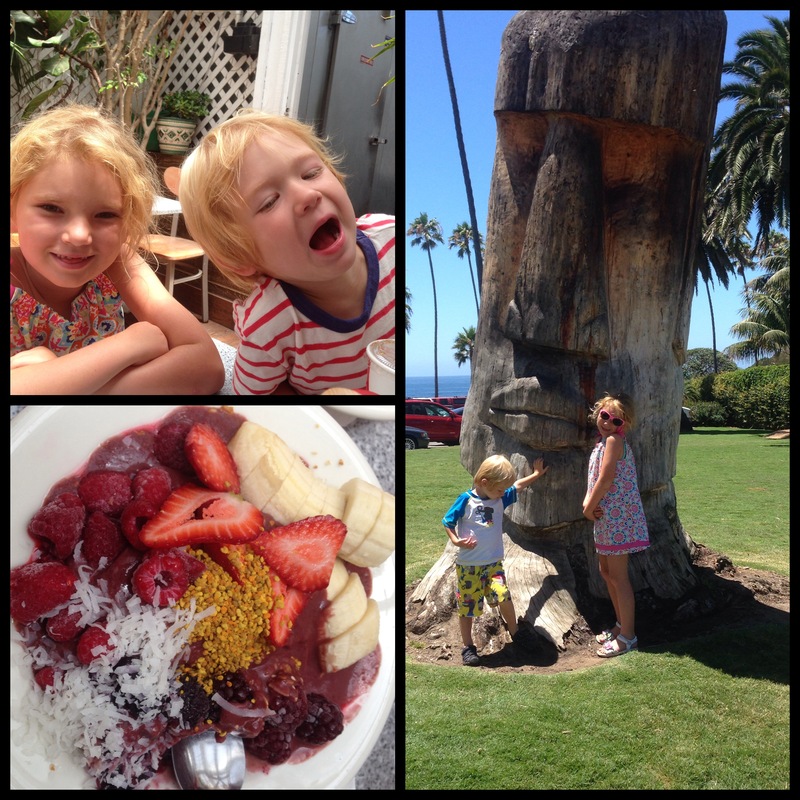 Acai bowl, tiki tree, and goofy kiddos. The top picture is right before Eric asked the question, “Do you think mermaids really can talk?” Amused at how he assumes mermaids and questions the talking part. Love it, love it, love it. California babies. Katie was in her element today. Project Sandcastle! We went big today: moats, bridges, drip turrets, sand molds. And after playing for hours, I got to read on the beach—for the first time in slightly over SIX years. I celebrate the kiddos now being older and therefore more autonomous. 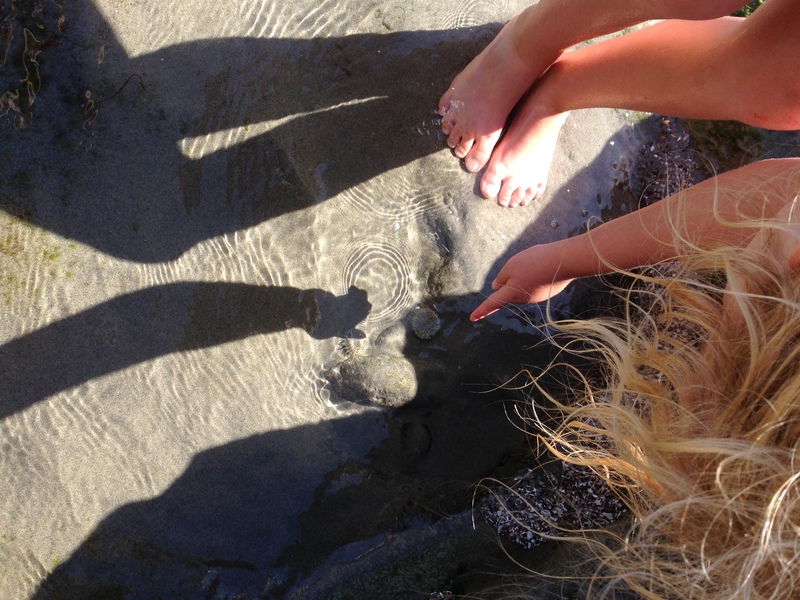 When I have taken them to the beach before, I always felt the need to keep my eyes glued to them and to be playing constantly with them. So this was a real treat, and a moment that felt balancing. 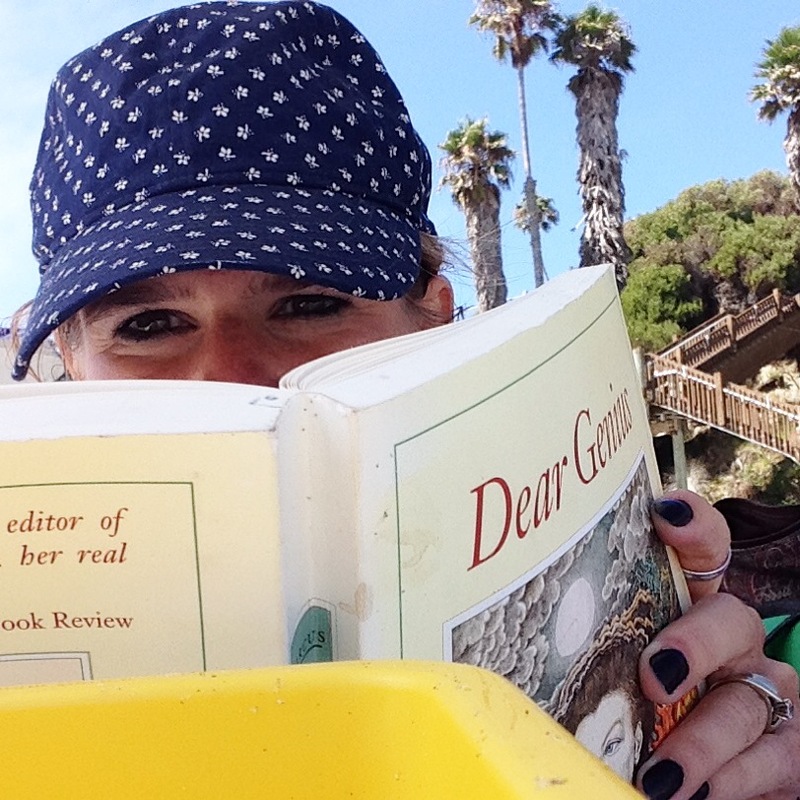 Reading on the beach is one of life’s truest pleasures… I can’t begin to say how much I have missed it. 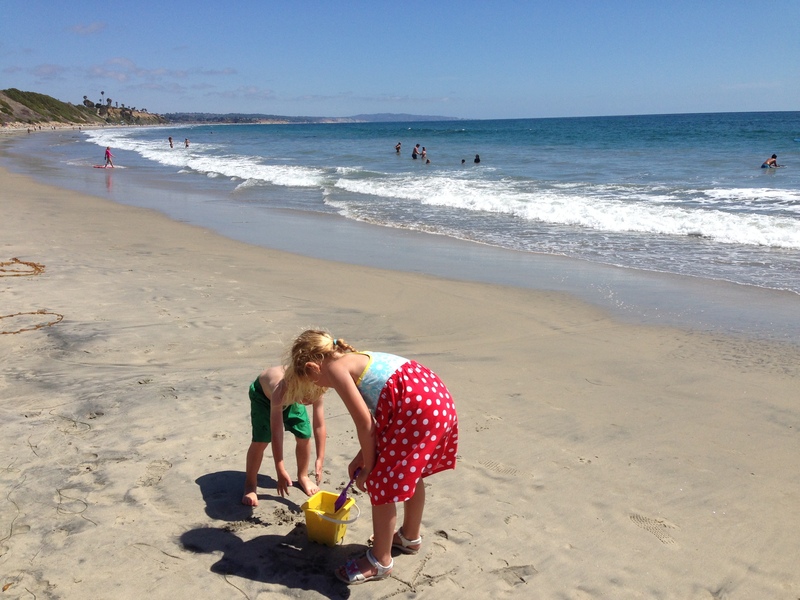 Eventually I drove just a bit further down the 101 to Solana Beach to treat them to dinner. 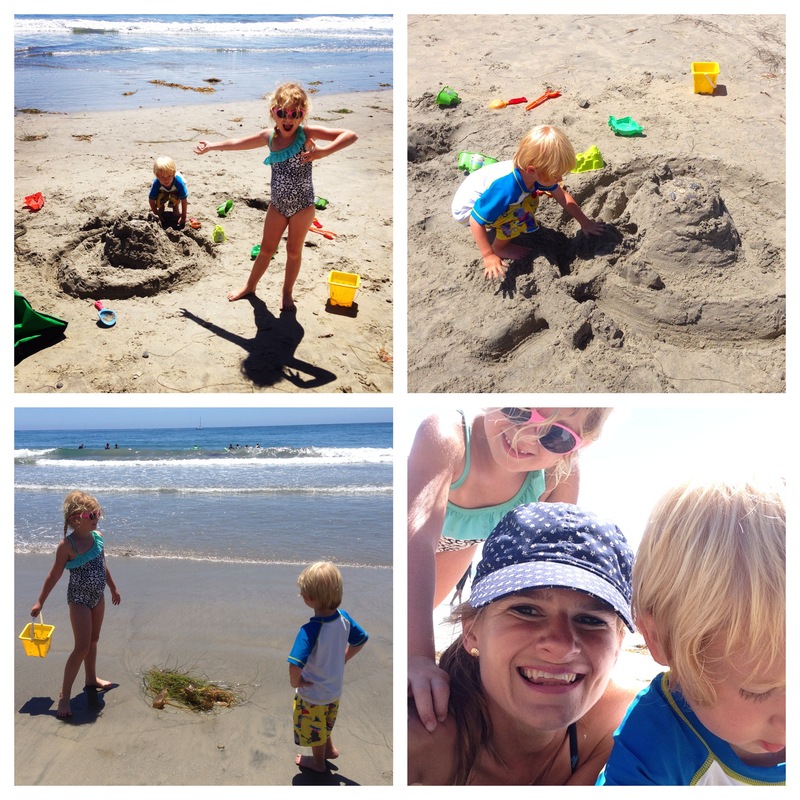 My parents honeymooned in Solana Beach, and I wanted to make a memory with my kiddos there in light of that. We had talked a great deal today about how wide open our day was, how we could live slowly, how we could do and be and create whatever we wanted as a memory. We never have to be stuck. One moment does not define us, Katie. One moment does not define you, readers. So what if there has been a mess up on the page? Stick it out. Try again. Table the draft and begin anew with gusto. Try not to be afraid. Just…write it out. Even through the chaos.